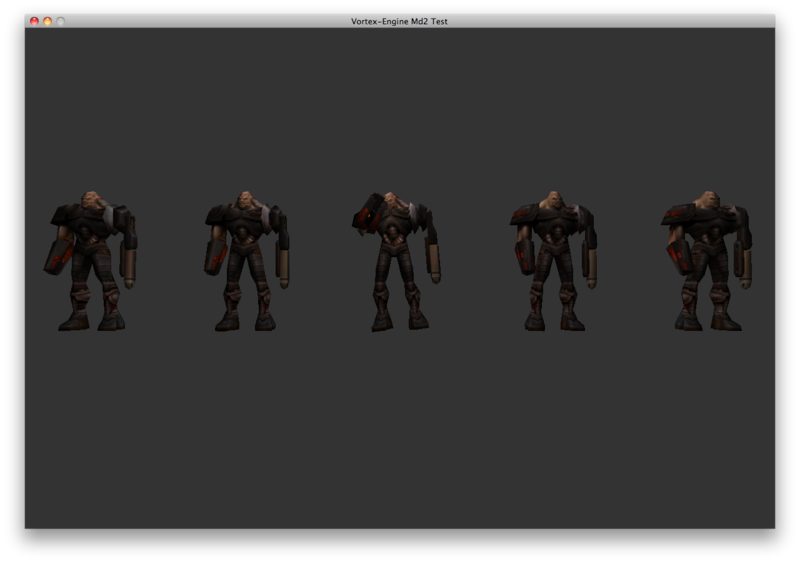 These last few days I’ve been improving the Vortex-Engine support for Md2 Model files. 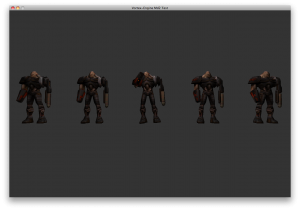 Md2 models can now be “instanced” from the same data at the Engine level (not to be confused with GPU instancing) and different animations can be assigned to each model. The idea for the short-term is to be able to provide entities the ability to create a Md2 model instance and animate it however they like without causing conflicts with other entities that instantiate the same model. There’s a video I created, where you can see the test, right after the jump. For the past month and a half I’ve been working on and off on a project that consists in the development of a custom Quake 2 BSP map renderer. The renderer was written from scratch using nothing but C++ and OpenGL 2.0. Click on the image for more screenshots. 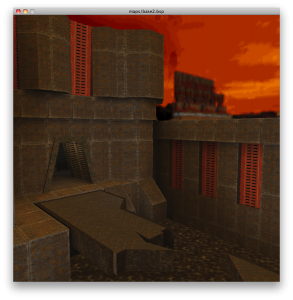 The project’s objective was twofold: to help develop the foundation for a custom object-oriented rendering engine and to test my skills at what seemed as such a daunting task as loading, rendering and navigating Quake 2 maps in realtime. There is a lot of information on the Internet regarding Id Software’s BSP file format and the way polygons, texture data, lightmaps and any other aspects of the game are stored. In my experience, no website provides “the whole picture”, so if you’re planning on rolling your own renderer, be prepared to spend as much time doing research online and developing and testing ideas as writing code. At its current status, I consider the renderer to be in a pretty good state, where it supports loading maps directly from Quake 2’s original PAK files, rendering its polygons, performing texture mapping, applying lightmaps, adding a skybox and leveraging the map’s visibility information to prevent large amounts of non-visible geometry from being sent to the Video Card. I’m glad I’ve been able to approximate the game’s look and feel in what I consider very close to the original. There are still many open points that could be addressed, such as experimenting with blur effects to increase the sky’s realism and bring life into the skybox. All texture mapping and lighting is currently done using shaders, so the basic foundation for post production visual effects is laid and ready to be built upon. At some point, I might provide executable versions of the renderer so you can try it yourself. In the mean time, if you’d like to view other rendered images, I’ve added more screenshots from this project at the Projects page of this site. Quake 2 and all of its art is Copyright (C) Id Software. Thanks to Id for creating such a great game.